I was an Expat in Singapore for nearly 5 years and during this time I’ve experienced a roller coaster ride of emotions, the good, the bad and the downright ugly! The thought of being an Expat can be far more exciting than the experience itself depending on many factors. When it comes to Singapore, being an Expat there can be very difficult and I’m not the only Expat who thinks or knows first-hand the reality of what I’m about to say. 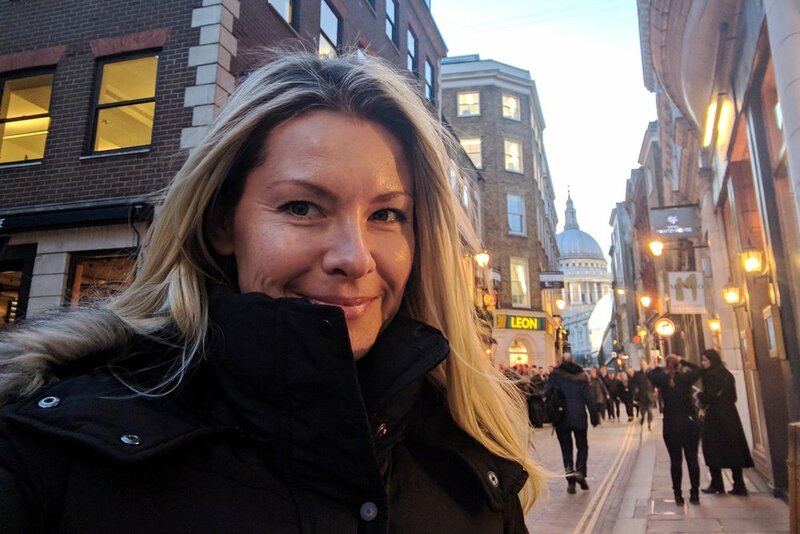 Although this blog post is around emotional stress factors of ‘Singapore Expat Life’, I also want to incorporate and ‘stress’ there are many upsides to being an Expat (anywhere) too! I’ve learned so much about myself over these years, more than I would have if I’d not left Australia. I’ve become an even stronger woman through this process. When you’ve had multiple incidents like hurricanes, snow storms, cultural diversity, and learned the great divide of distance from loved ones…. Well, let’s just say I’ve been enlightened and know I can tackle things now with much more ease. This is the truth through my eyes and experience which is why I felt my emotional stress rise. Please note halfway through this blog post I do point out a lot of great reasons to live in Singapore, it’s not all doom and gloom! So here is a list of reasons why I was stressed! I’m so serious when I say these words it’s the first and foremost hardest thing dealing with this when you first move to Singapore. This is because a large majority of high-income earners who are expats work in Banking or Gas and Oil and/or are CEO’s/MD/GM and are classed as the ‘elite people’ therefore if you don’t earn at least SGD $350k – you are classed as a ‘cockroach’! I’m serious! To make matters worse most people are very materialistic and some even compete on who has the most expensive apartments, some even rent apartments they can’t really afford just to ‘keep up and look good’. Whilst we were only spending SGD $6k per month on an apartment, others were spending between $8k to $15k per month! That’s just silly money! Plus, you will be judged by your husband’s job and what he earns (yes this really happens, sad I know!). Money is a major factor in Singapore, everyone wants to appear wealthy. Labels/Designer wear, money, share portfolios, assets etc are all topics of conversation and who is wealthier than who AND who can outdo who, yes that's what it's really about! This causes stress because making new friends can be very difficult it’s very judgmental. You are judged on your 'Net Worth'. This is why I steered clear of ‘these women!’ they lack emotional maturity! The upside ‘If you can survive the Singapore Expat Wives Club you can deal with anyone and anything!’… Think of Characters like Joan Collins (Alexis Carrington) Dynasty, Heather Locklear (Amanda Woodward) Melrose Place, and Leighton Meester (Blair Waldorf) Gossip Girl, yes that bad! - note not 'all' the expat wives are this bad! If you have a car well….. excuse me! Don’t even get me started on the car situation…. I once had an expat woman give me the most ludicrous statement about cars I thought to myself ‘WOW these women are insane!’. To own a car is seen to be classed as wealthy, but to lease one is considered poor?? That’s why most only own or catch public transport/taxis (seriously??) Owning a car is a very big deal due to cost. Buying a car, you need the CEO Certificate Of Entitlement which can be around $80k SGD giving you 10 years registration, however you have to pay for the car on top of that. But to lease a car can be as little as $1k per month. Public transport and taxis are cheap but apparently leasing a car makes you look poor? Oh my Prada I can’t believe I’ve had to type something so ridiculous but it’s true! This causes stress because you’re judged by not having a car. I’m not joking! This is the yearly haze from Indonesia and at times it's worse than this! You are surrounded by pollution especially with the yearly haze which is horrible (thanks Indo for the palm oil burning!). When you have the haze you will struggle to breathe, you can’t go outside and visibility across the island is limited. It can get so bad you will have to fly out and head to another country, I’ve had to do it when the PSI level got over 400 because I couldn’t breathe! This causes stress because your health is affected. If you are not good with humidity then you will struggle with your health even more. Your health will suffer due to constant mould exposure (mould is everywhere) it’s in shopping centres, your apartment, taxis, trains etc the entire island is one big mould area. Furniture will go mouldy, walls in your apartment can go mouldy. Clothes oh the clothes I once went away for a month and didn’t have time to dry clean all my husband's suits before we left. I forgot to get the Pink Hippos for the wardrobes and I returned to his suits and some of our clothes covered in mould! It was disgusting! Thankfully the dry cleaning dealt with it! 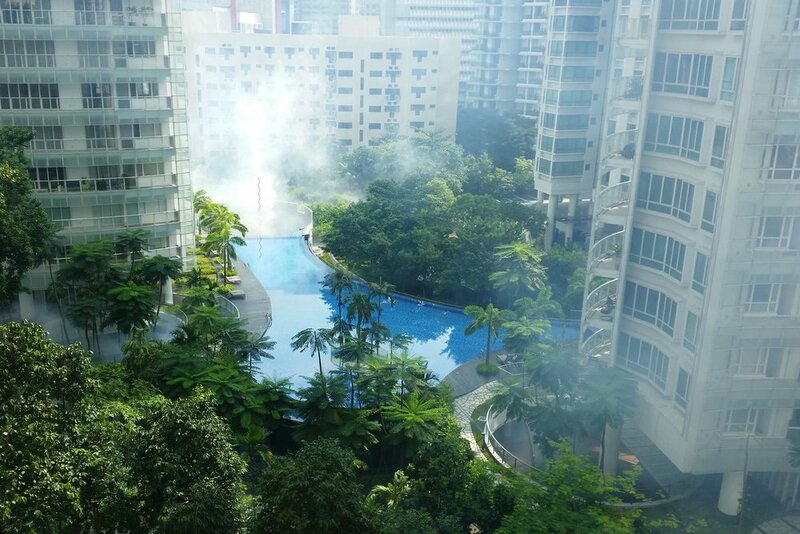 The condo opposite my apartment getting it's weekly fogging for mosquitoes. Constant fogging for mosquitoes happens all the time around the island. They claim it’s safe and non-harmful but to me if it’s killing something then how safe is it to breathe in?? They wear masks when they are fogging and the smell stinks! But then I think it’s better than getting Dengue Fever or Zika Virus both of which are in Singapore. Thankfully there are a few fantastic health groups on Facebook you can join where these women who have lived in Singapore for many years are across most things. They are a very valuable source of information and can help with advice, Dr referrals etc. This causes stress because when you’re not well physically your emotional state also suffers. Sadly, I’ve seen many families fall apart due to cheating spouses. Some I know have gotten away with their (multiple) affairs and their spouses are none the wiser, others have been found out and gotten divorced. But the stress of being an expat family can cause cheating for both wives and husbands. I say you should always try to let your partner know you’re unhappy and tell them multiple times and THEN if they don’t listen ‘break up’ before you move on! Cheating is a hard-line no-no in my book! This causes stress because when your marriage falls apart your life changes forever. Eating out costs a fortune for average quality food, I’ve been served off/mouldy food on several occasions and let’s not forget alcohol is super expensive! I mean a beer can cost you $20 SGD and it’s not even a good beer. And don’t even get me started on the service! It’s terrible you will want to pull your hair out! If you’re not good with eating MSG then make sure you ask if it’s in the food because it’s used in most places. This causes stress because you just want a good night out that doesn’t cost the earth! If you want to eat healthy (particularly organic food) then be prepared to spend a fortune on food. Almost all food is imported in therefore it costs a fortune and unfortunately the quality is lacking as it’s been in transit for a while then in cold storage before it makes the shelves! Then you shop and get it home and within a few days, it’s mouldy! The only place where you’re guaranteed fresh produce is Little Farms where the Australian owner imports weekly! Renting apartments are expensive for what they are considering the cost. However, the upside to living in Singapore over Hong Kong is value for money when it comes to space/size of the apartment. International schools are very expensive for an average education, the average cost for a child per year is between $20 - $30K SGD yes that’s correct. Things like your power bills are expensive too, the cost of power isn’t cheap but if you want to live in comfort in your apartment most people use their air conditions, this also helps reduce mould in the house. Except for the fact, your air conditioners go mouldy really quickly! Chemical cleans are required often to get rid of the mould, note these are also expensive but imperative for your health! Other things that will cost a fortune if you like golfing or horse riding then be warned it’s very expensive! This causes stress because things you like doing/comforts from back home may not be accessible here. Getting a taxi when it’s raining is near impossible and it’s made worse when it’s change over time, it becomes a nightmare to get a taxi! You can only hail a taxi from a taxi queue – really annoying when there’s not one insight and you have to walk for ages to find one! To add insult to injury not all of the taxi drivers know where they are going… thankfully the taxis are so cheap! There is a great train system called MRT and catching trains is super cheap, they run all the time and the network is easy to use. But when it’s peak hour you will get squashed. This causes stress because after a few years you might want to scream when dealing with this. You will get sick and tired of wearing lightweight summer clothes and sandals all the time. You’ll miss having seasons because occasionally we need a little bit of winter! That’s when it’s time to get off the island and escape that’s what I used to do. Listening to the word ‘Lah’ all the time will drive you insane as locals use it all the time, they finish their sentences with it! One time I had a woman use ‘Lah’ 10 times within 1 minute, seriously I did. But if you know what ‘Two cans can, two cans can not’ means then you've been there a long time! Ha ha ha (basically there are 4 cans of beer on the table, 2 are finished, 2 are still going, so you are saying you can take away 2 of the beer cans!) Oh I forgot to add the word ‘Lah!’. The processes of how everything works will drive you to drink (literally!) because most of the locals are smart academically but common sense and ‘thinking’ outside of the box is not something they excel in. Their processes seem difficult and even over complicated for something which is so simple! Whatever you do don’t try to change/order anything on the menu unless it’s written out in black and white! Seriously I’m not joking! In the shopping centers, the constant slow pace everyone walks is annoying and don’t even get me started with the STOPPING at the end/top of the escalator where I’ve had to physically push people out the way! MOVE away from the escalator people others need to get off and walk, don’t stand there and try to decide the way you want to walk? The country seems flashy and new but it’s lost is soul, too many old historical buildings have been knocked down and replaced with new flashy buildings. The only way to describe it accurately is unhappy and fake. No amount of flashing lights and constant new shopping malls can make a city have soul and vibrancy. It’s hard to find a good hairdresser if you’re blonde! (thankfully I did!). I’m just saying that it’s not easy and a lot of expats find it hard! There’s lots of shopping but it’s all the cookie cutter same brands in each shopping mall. This causes stress because seriously how hard can it be? I travel a lot so I’m a frequent flyer with Singapore Airlines, gold status. This airline will not look after you at all. They don’t look after anyone, so please don’t think you’re going to get the same service you might get back in your homeland. No upgrades, hard to use points and expensive flights, plus they can make trying to amend a book a nightmare… just saying. One time I had to extend my stay in Australia, this ended up taking me 5 calls to the airline over 2 weeks to amend a booking! Seriously! Because I had paid for exit row and didn’t want to lose that, they had the seats available but needed permission from management? The nightmare that unfolded because of this caused me so much stress! This causes stress because shouldn’t you look after your Frequent Flyers? Now that I’ve scared you away with the negative things about this country, I’ll share with you the good things Singapore has to offer! And I will say some of the local people you will meet are really lovely people! The biggest and best thing about Singapore is the TAX RATE! You can save money due to low taxes and I mean save money if you don’t get caught up in the ‘Keeping up with the Joneses’ cycle. Here your bank account can grow if you are smart about it! Let me say again the best thing about being a Singapore Expat is the TAX RATE! Trust me we ALL feel the pain when we leave! Singapore is very very very safe! (It’s up there with Seoul and Japan). They are so strict with everything the average crime is solved in 45 mins and that’s normally for bike theft. Seriously! This government makes sure everyone does the right thing. There are cameras all over the place, SMILE big brother is watching. If you have a family and want to know they are safe and will have lots to do then Singapore is a great country for you. Most of the condos have areas for the children to play. There’s a lot to do on Sentosa Island as well. Shopping malls like Vivo City have playground areas for them to run around. Plus, it’s so hot they can swim all the time as most condos have pools. You will grow as a person when you leave your family and friends behind. It’s a natural thing that will happen. Some people find it to be overwhelming, however, some find it enlightening. Learning your weakness can help you turn them into strengths. Discovering how strong you are empowering. It doesn’t take long when you are out of your comfort zone before you start to discover who you are. Some have taken the opportunity to ‘recreate themselves’ and become who they want to be without the influence of people back ‘home’. This is the time when you can expand your friendship circle. There are loads of Expats that live in Singapore. In the grand scheme of things when you think about it, making new friends from other countries always means you have more friends to visit globally! Win, win, I say, making new friends and then seeing them on your travels. I’ve made a few lifelong friends. From a career perspective, it always looks good living and working aboard. It shows you’ve been exposed to a different culture, gain alternative perspectives on things and have flexibility. Why do I use the word flexibility? Because when you are living in a different country you need to adapt yourself to their culture thus being flexible. It also shows you are willing to move for your job as well. Just like Hong Kong, the taxis are cheap in Singapore too which is great! The upside is you can drink and go out more because getting around is easier (look out liver, ha ha ha!). Plus the MRT (Mass Rapid Transit) is fantastic, the trains run all the time and again it’s super super cheap! Unlike Sydney and London prices! Great Travel destinations are just at your doorstep! The vibrancy of Hong Kong and Japan is only a few hours away with flights there all the time. Sometimes you can get great deals with the budget airlines (definitely won’t get cheap flights with Singapore Air!). I say this with some experience as I have travelled a large amount. There’s a reason Changi has been voted best airport in the world 5 years straight. That’s because it’s easy to get around, everything is well signed, travelators everywhere, efficient passport control especially being an expat. You just walk up to the machines insert your passport, walk through the gate, scan your thumbprint and you are done! Basically, there are no seasons in Singapore although to be fair it’s cooler and more tropical with daily rain at 4 pm between November to February. However, that being said it’s lightweight breathable clothes at all time and sandals. However, you need to carry the following two things at all times. Your trusty friend mister umbrella so you don’t get caught out. The other a scarf because the shopping malls are generally too cold. The Singaporeans LOVE their air conditioning! Having a full time live in helper is possible because it’s cheap and I mean cheap. The average is less than SGD $1k per month including benefits. The more expensive the better the helper (In most cases!). if you don’t like the thought of having someone clean, cook, food shop, make your bed and basically do all your domestic duties Mon to Saturday then you can do what I did and get a house cleaner, it’s cheap and easy. Oh, how I miss that now! Interestingly enough I was chatting to one of the woman from the Singapore office the other week who has also relocated to London. She was in Singapore for 7 years. She too has said the same as me regarding the above. So what does the ‘Big 3’ Stress Solutions Puzzle look like when it comes to Emotional Stress as an Expat Living in Singapore? I’ve been told by many people being an expat in Singapore is being an expat for beginners, ironically these people with their opinions have never been expat themselves! So let me set the record straight as an expat who has lived in a few different countries. Singapore is NOT expat land for beginners at all! To make it as an expat in Singapore takes hard work. Unlike living in the USA or London, where things are much easier. Singapore will take you to a level or sheer frustration quickly. This has been my experience. My emotional stress some days was off the charts, thankfully I learned to manage it better and see the positive in it all. Remember my motto for positive change is ‘Little Puzzle Pieces Create a Big Picture’… If you don’t experience it for yourself you’ll never know. You can’t judge, know or think you know without actually doing it and living it. You might be surprised at how positive the experience on your life will be and how grateful you are that you took the leap of faith and lived that Expat life in Singapore yourself!